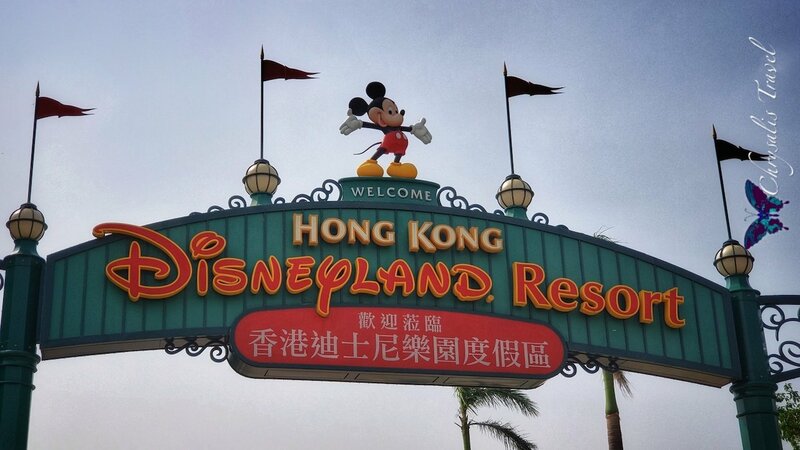 Hong Kong Disneyland (HKDL) is the smallest Asian Disney Park, celebrating its 13th Anniversary this year. 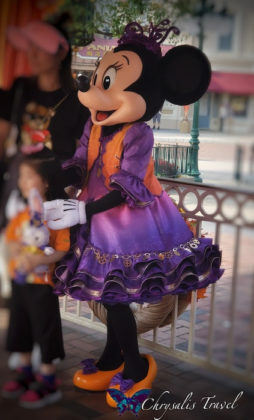 But what HKDL lacks in size it makes up for in unique attractions and its edgy spin on Halloween that is unlike any other Disney Park. 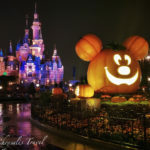 Best of all – like its Asian counterparts – all the Halloween festivities are included in your Hong Kong Disneyland admission ticket. 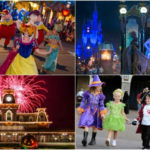 A specially-priced 2-day Tourist ticket is about $89 USD: less than the price of a Halloween party in our domestic Disney Parks. 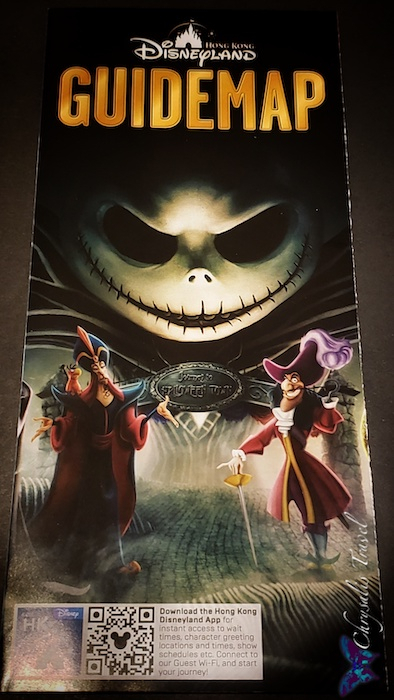 This season’s Hong Kong Disneyland map features Jack Skellington with villains Jafar and Captain Hook on the cover. 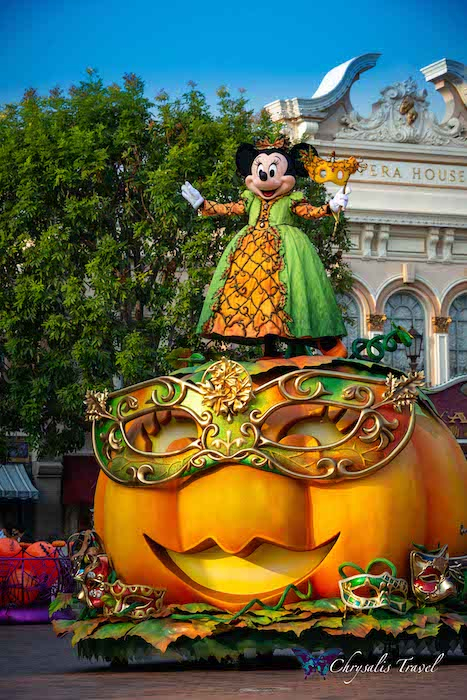 On the lighter side, “Mickey’s Halloween Time Street Party!” is the daytime parade with Mickey and pals. 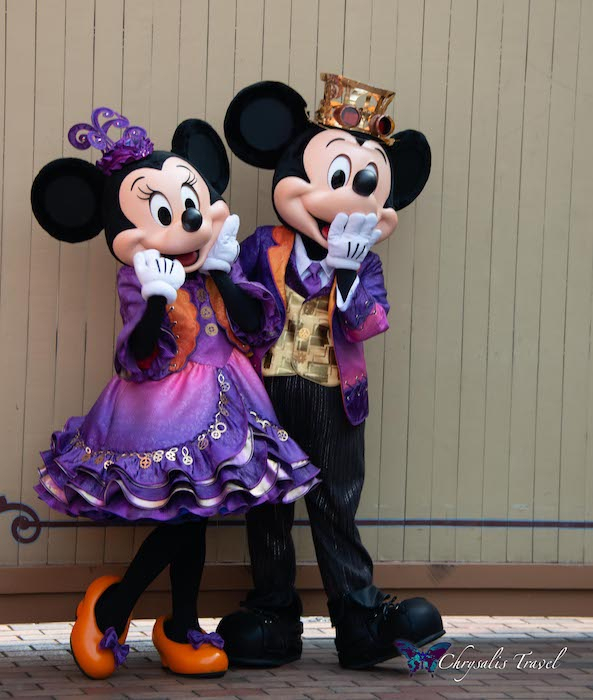 Don’t miss meet and greets with your favorite Disney characters dressed in their Halloween best, and trick-or-treating in the Festival Gardens. Or tap into your creative side by making a Mexican paper banner in celebration of CoCo. Ready to take a closer look? Let’s dig in. 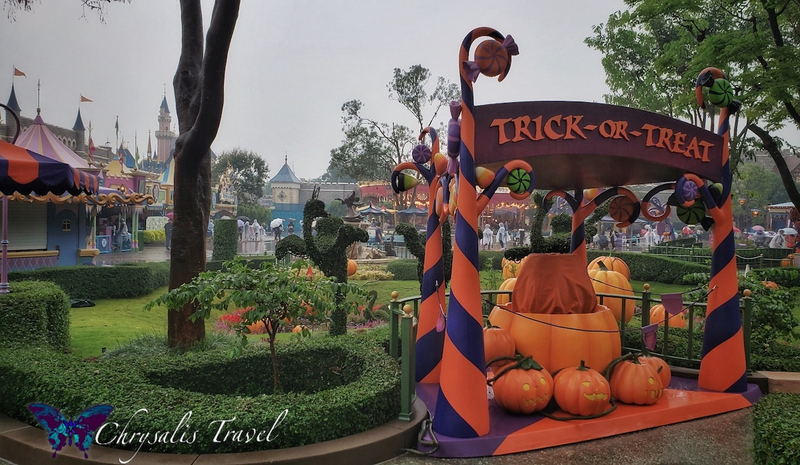 The Halloween décor at Hong Kong Disneyland was festive and inspired. 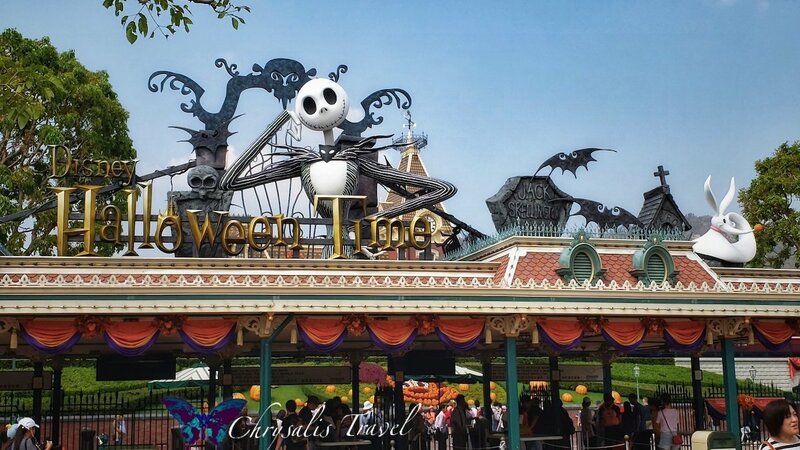 Jack Skellington and Zero stood guard above the entry gates, welcoming all guests. 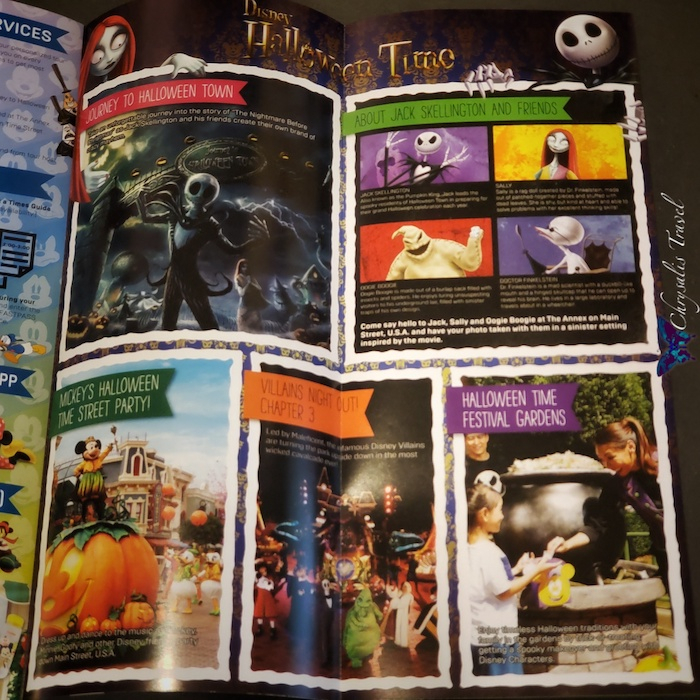 Jack features prominently this year, especially since The Nightmare Before Christmas is celebrating its 25th Anniversary. We always love seeing the Mickey topiary in front of the train station. 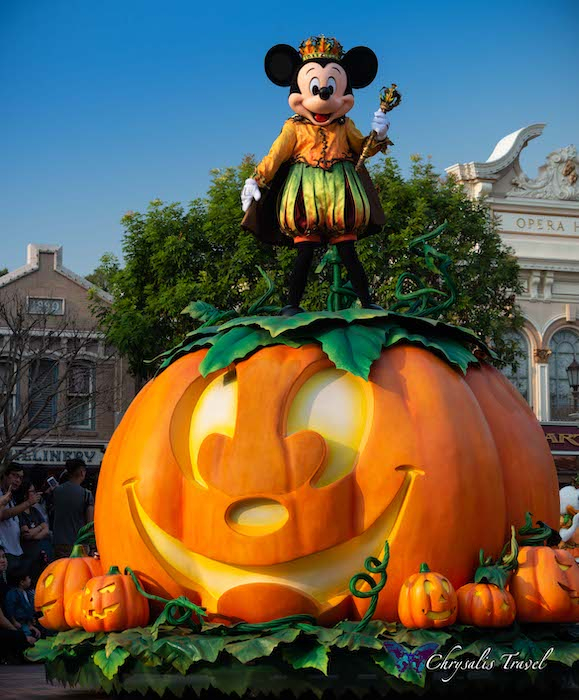 Star-studded pumpkins accompany this orange-themed Mickey. See the train above? 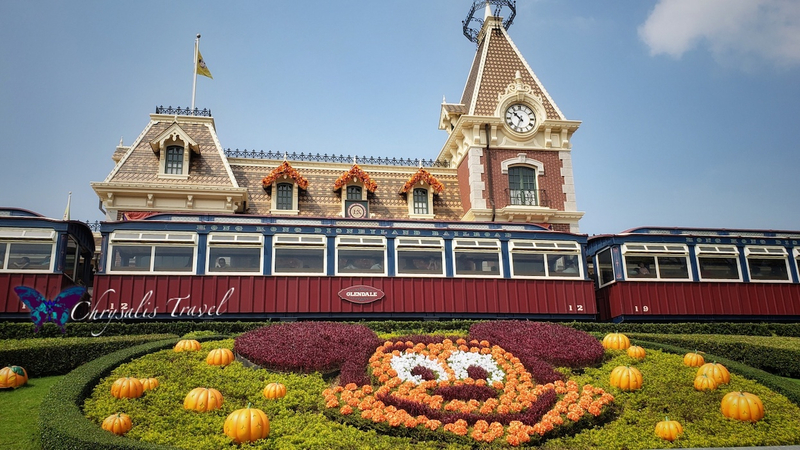 The HKDL train cars are named after Southern California cities like Glendale, Burbank, and Anaheim. Remember the entry plaque at Disneyland? 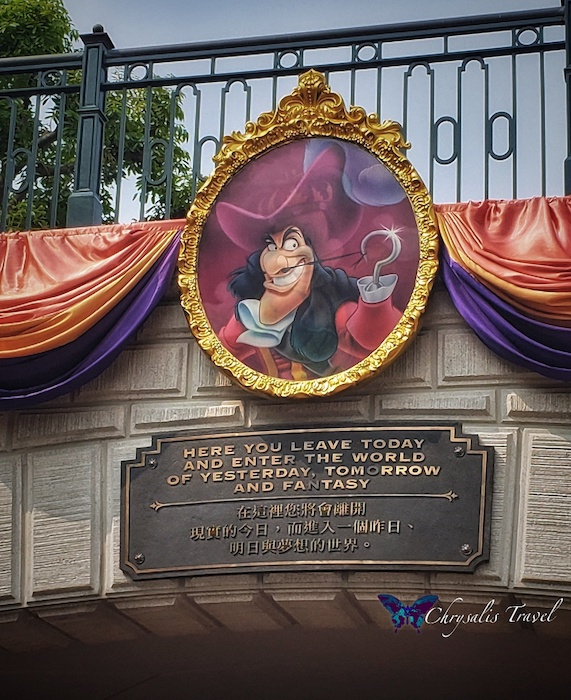 Here is the entry plaque at Hong Kong Disneyland – Walt’s words are translated into Chinese. A portrait of Captain Hook graces the railing above. 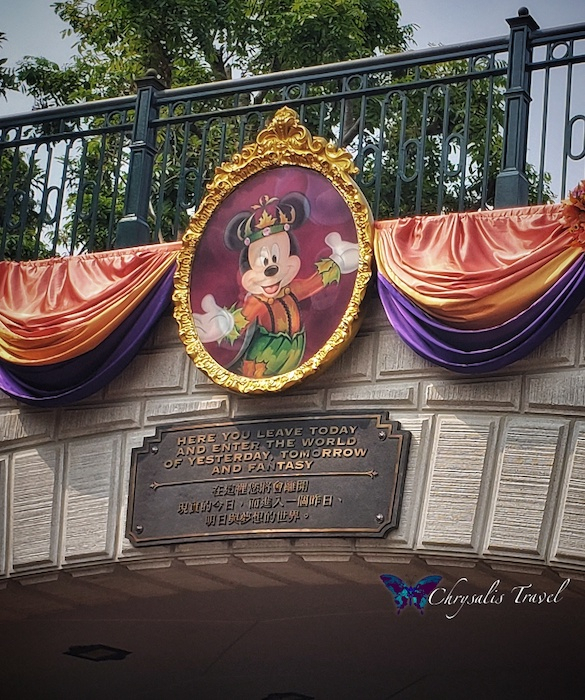 The portrait is a lenticular (similar to those at Tokyo DisneySea this year). The other picture is of Mickey, of course! The train station was decked out with festive fall foliage. 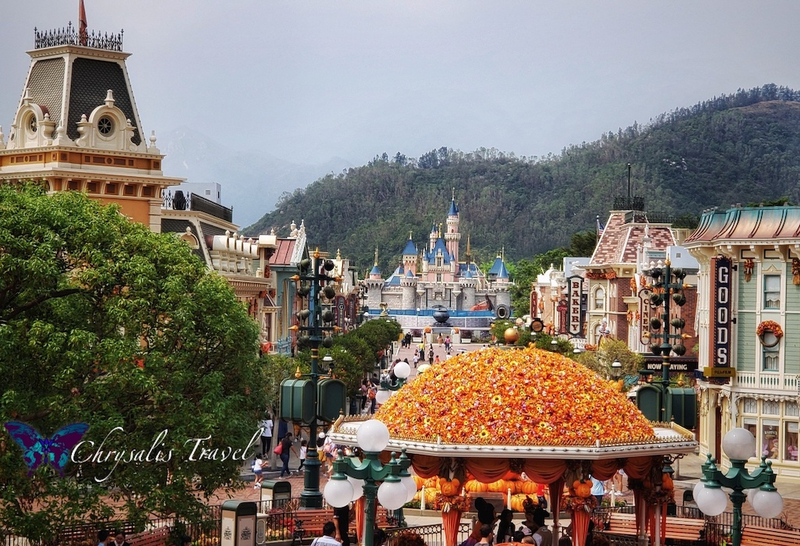 Did you know that the elevation of Hong Kong Disneyland is only 39 feet above sea level? It’s worth the climb up to the train station. Here’s the one-of-a-kind view down Main Street U.S.A.
Just behind the gazebo is a giant Mickey pumpkin with an even bigger grin. It was similar in size to the one at Disneyland. 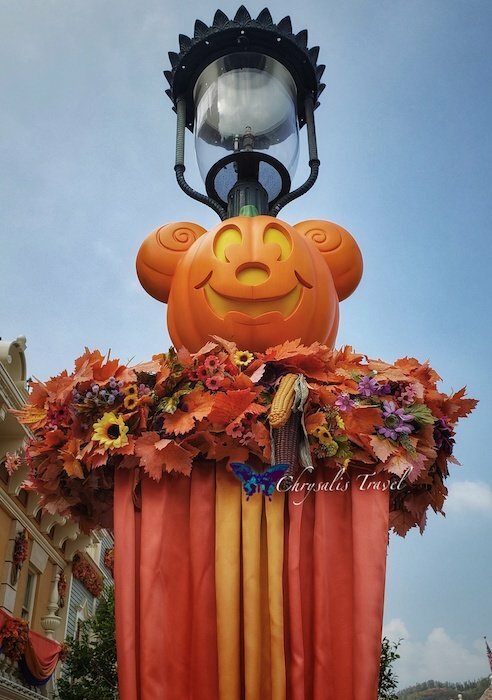 We found unique Halloween Mickey lamppost decorations at every Disney Park (we visited five of the six Disney castles this October). 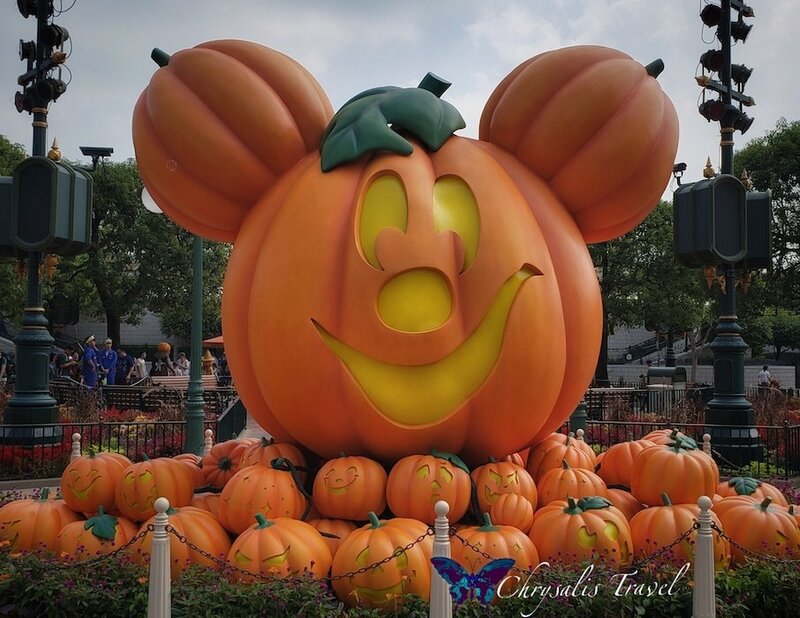 These whimsical Mickey pumpkins at Hong Kong Disneyland were particularly endearing. Mickey wasn’t the only one immortalized with pumpkins. 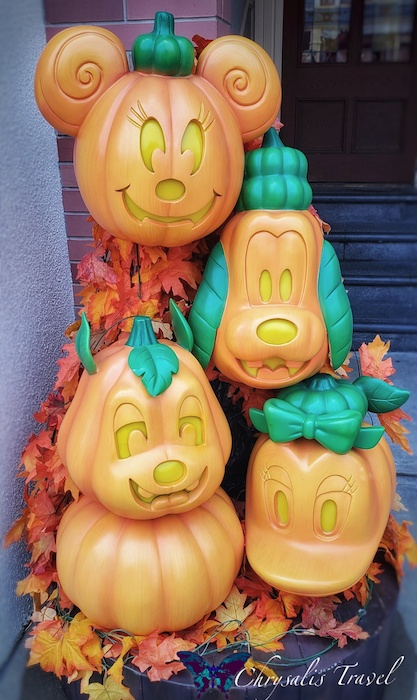 Here are Minnie, Goofy, Daisy, and Dale pumpkins on Main Street. The “Street Party” was a playful parade with walking and stop segments. We were positioned on Main Street in front of the Emporium. Some performers rolled large carts of inflatable jack-o-lantern balls. From our vantage point, the parade went by, and they never used the balls. We walked through the Emporium, then found the parade had moved onto the castle stage during a stop segment, and the show had continued. Lesson learned: get a spot near the stage. 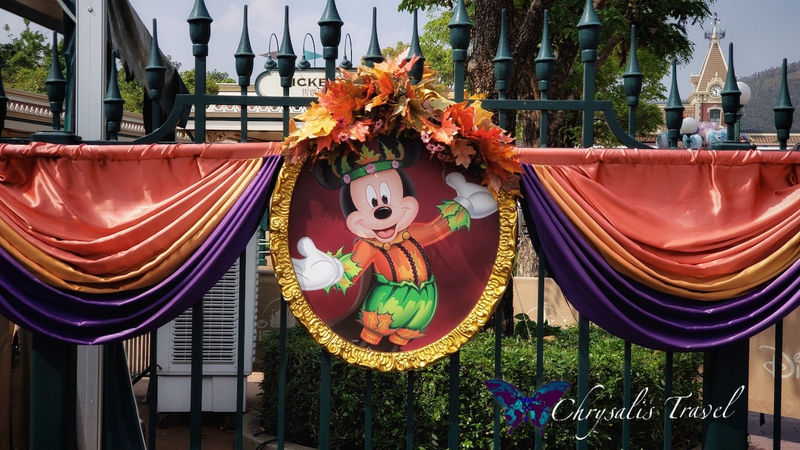 Mickey’s costume is fit for a King, as he greets guests on a cheery pumpkin float. Minnie is ready for a Venetian-style masquerade ball in her festive gown. 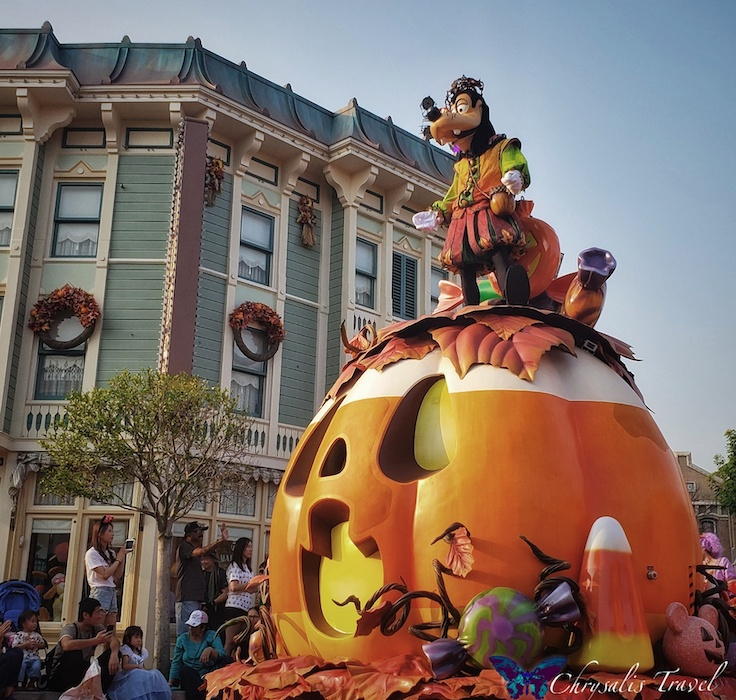 Goofy rides atop a giant candy corn, ready for some sweet fall festival fun. 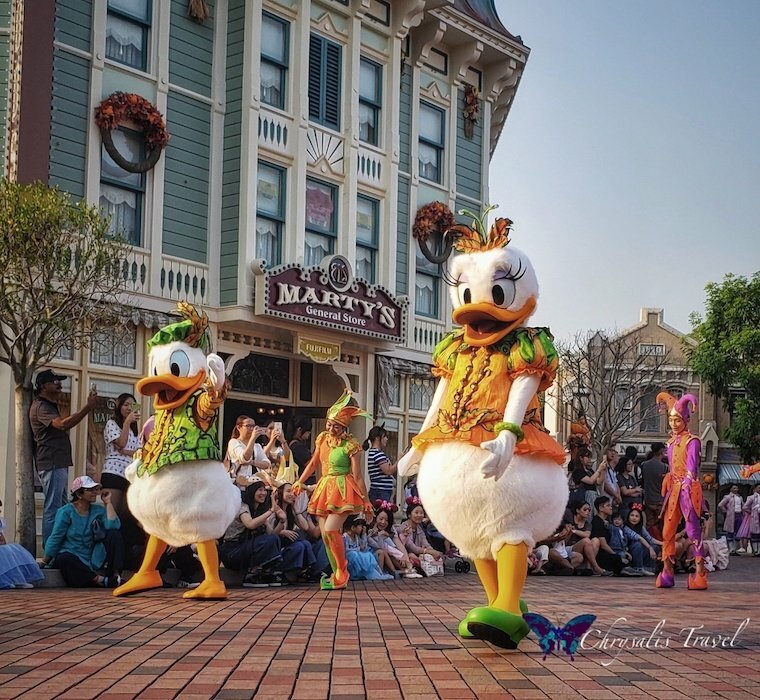 Donald and Daisy look splendid in their Halloween outfits. Of course, in the Asian Disney Parks, Duffy and friends are absolute celebrities. Here are (from left) ShellieMay, Duffy, and Gelatoni. We didn’t see StellaLou or Cookie in the parade. The Festival Gardens in Fantasyland were well themed for Halloween. Here – before 6 pm and when it is not raining – guests can pick up Mickey-themed boxes and collect candy from these Trick-or-Treat stations. We never seemed to get there at the right time, but we saw lots of other guests with Mickey candy boxes. The Festival Gardens were also a destination for character meet and greets. 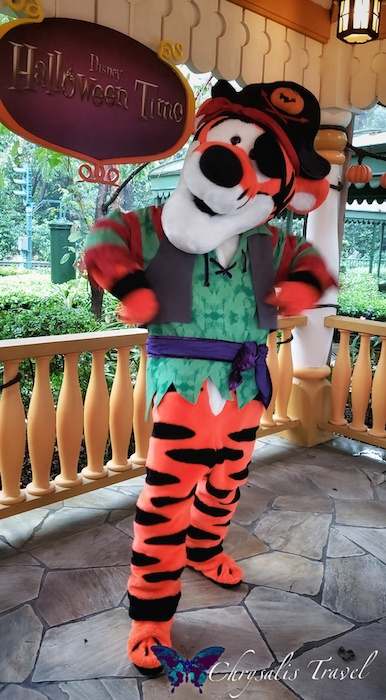 During the daytime, Winnie the Pooh and Tigger too – dressed as pirates –entertained guests. 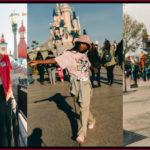 Meeting characters is a huge part of the Disney Park experience. For many, getting photos with characters in their exclusive seasonal costumes is a must. We noticed that Mickey and friends were dressed differently for their meet and greets than for the “Halloween Time Street Party” parade. Mickey and Minnie hosted guests under the large gazebo on Main Street. Then, they blew kisses before going offstage. 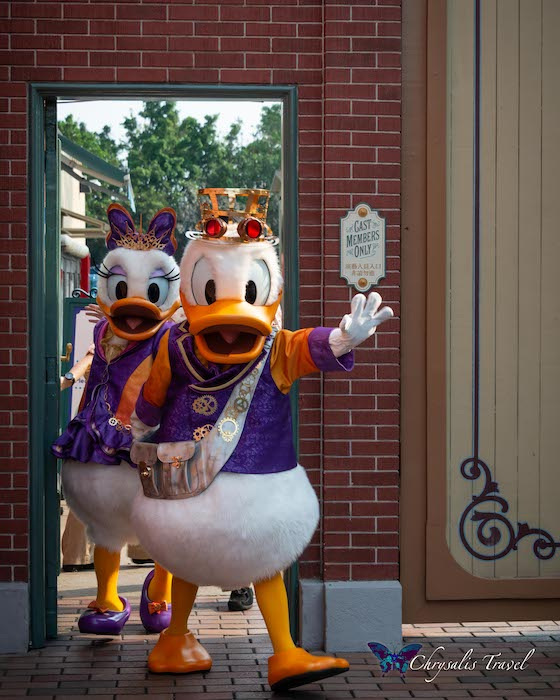 We caught up with Donald and Daisy coming on stage. 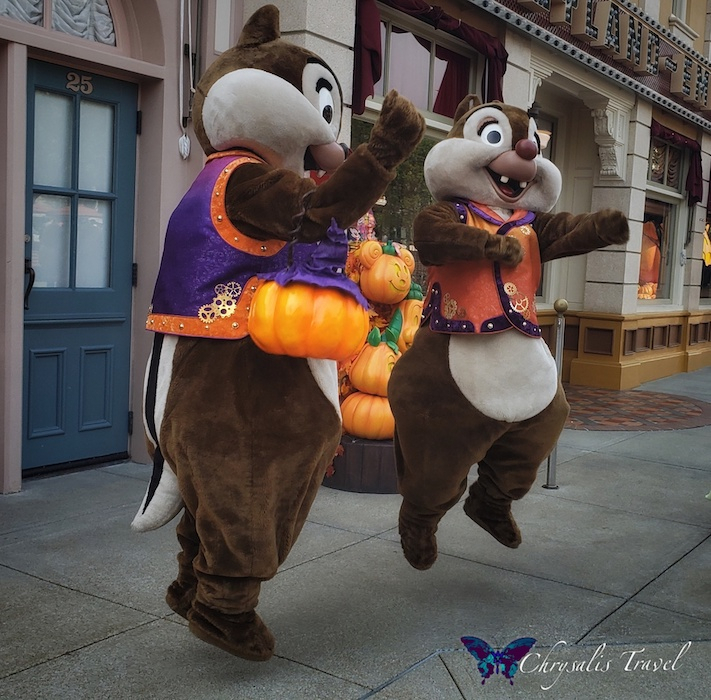 Chip and Dale amused guests with their antics. 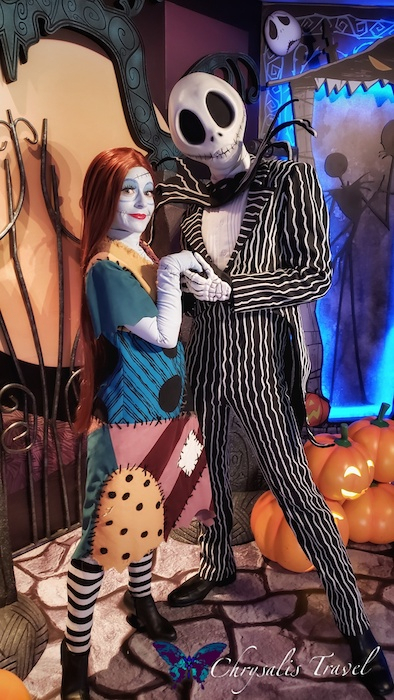 Of course, we can’t forget the stars of Halloween Town: Jack and Sally. 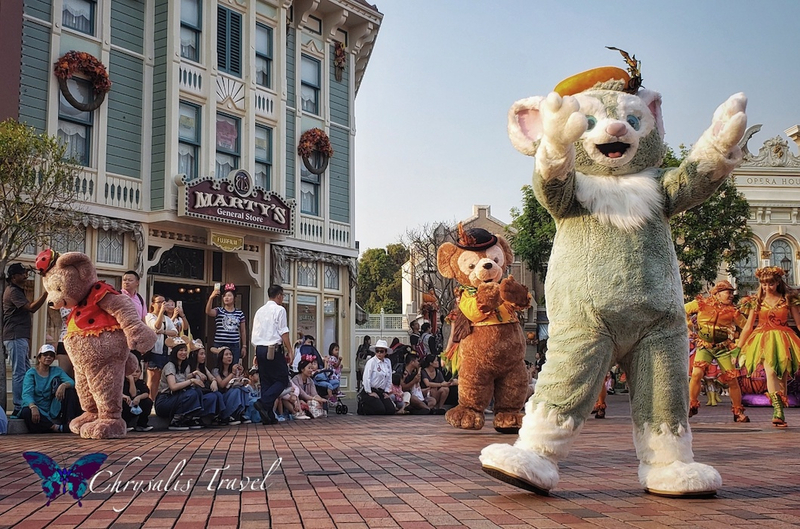 Duffy and friends are immensely popular in the Asian Disney Parks. They are joined this year by their newest friend, Cookie. 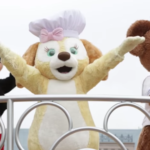 Cookie the dog is a baker, and she is exclusive to Hong Kong Disneyland. 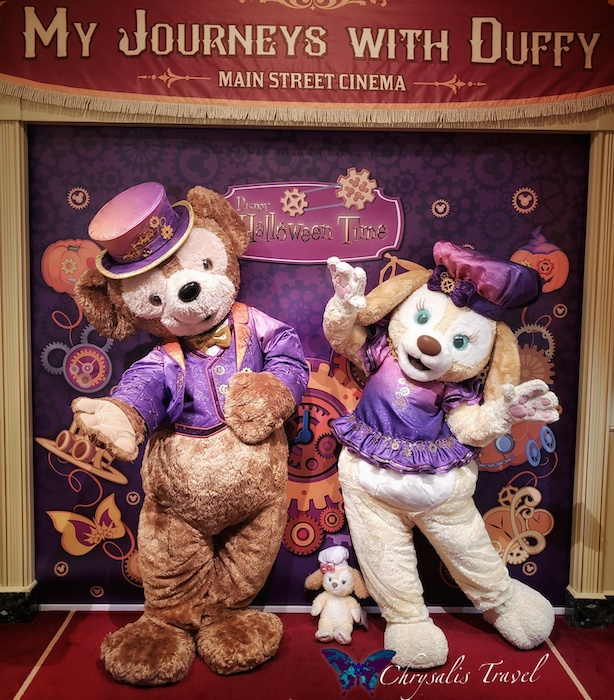 Here is Cookie in her first Halloween costume, posing with Duffy. Cookie also greeted guests with bunny friend StellaLou. Seeing all the festive merchandise is an integral part of experiencing each season at the Disney Parks. 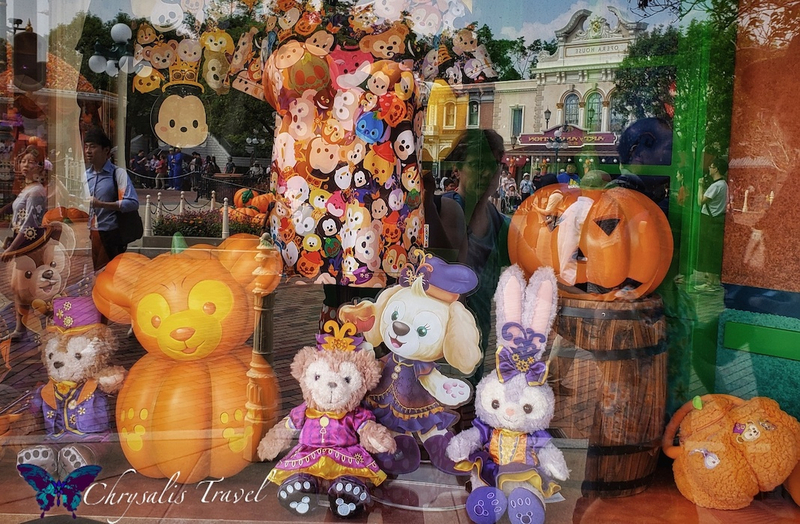 Hong Kong Disneyland created these exclusive Halloween Tsum Tsum shirts that we had seen guests wearing at Tokyo Disneyland. Of course, there was plenty of Duffy merch. This was Cookie’s first Halloween, but they were sold out of the medium-sized Cookie plush in her new costume. 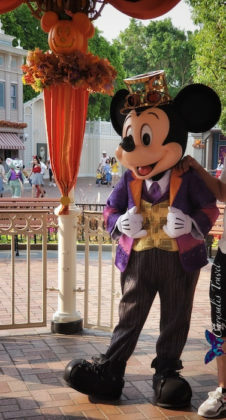 (We had seen a guest with one in Tokyo Disneyland). 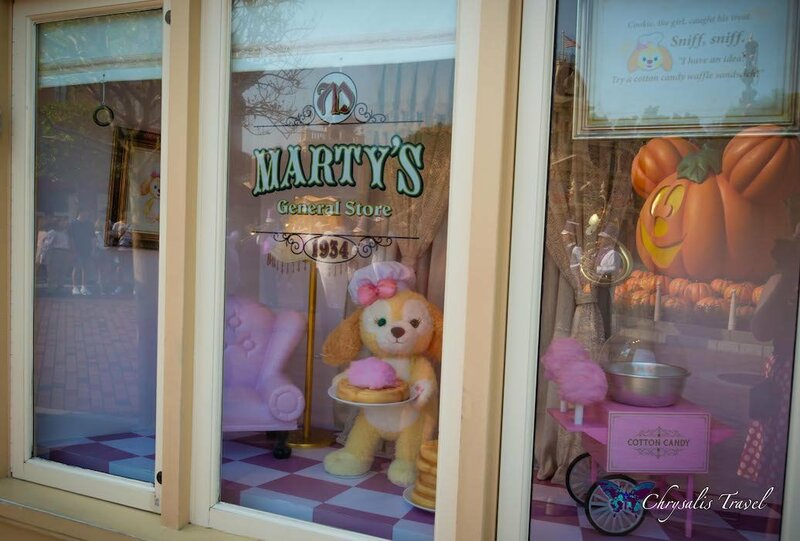 Here is Cookie’s display in the window of “Marty’s General Store.” The store is named for late Disney Legend and Imagineer Marty Sklar, who contributed to designing HKDL. The window is dated 1934, in honor of Marty’s birth year. 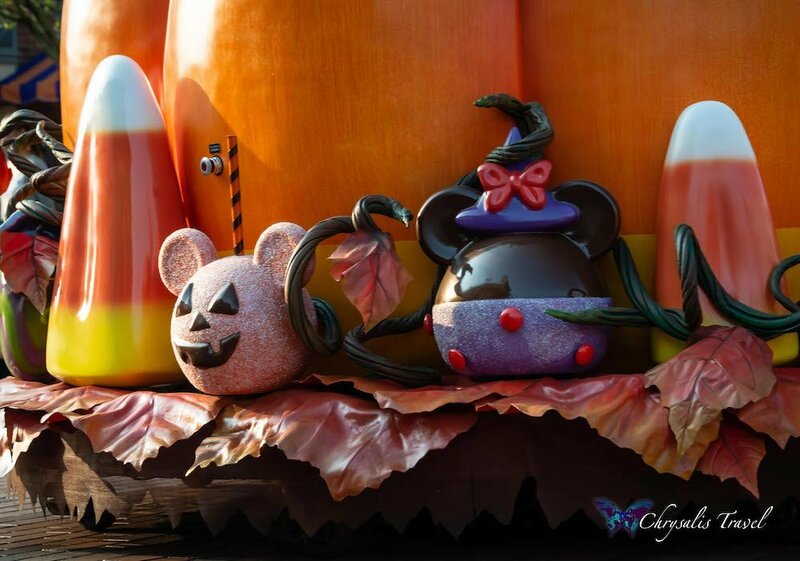 Do you see the giant Mickey pumpkin in the reflection? 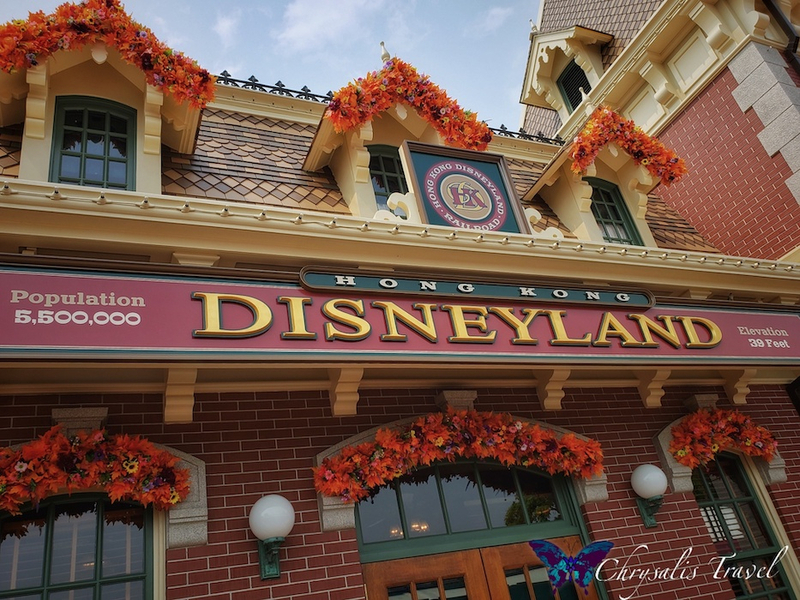 The first time we visited Hong Kong Disneyland, it was their 10th Anniversary. We love the spirit of this Park – every year is a celebration! 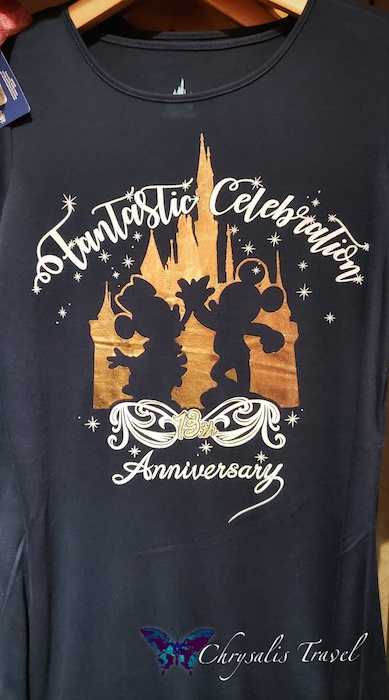 This year, they had merchandise for their 13th Anniversary. Want more of Disney’s Halloween? 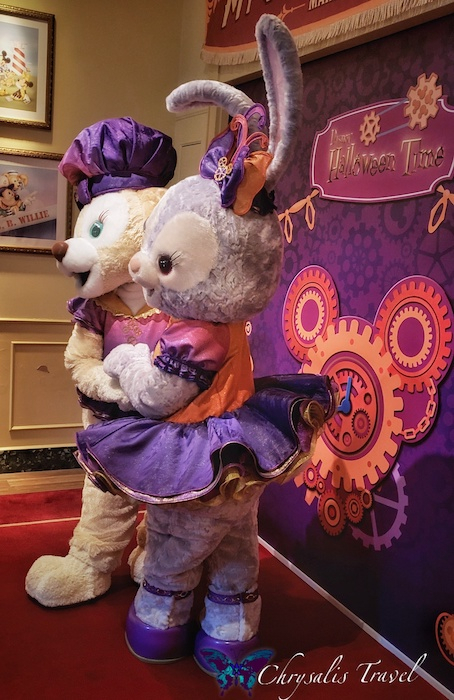 Read about our “Spooky Boo” experiences at Tokyo Disneyland, see the “Villains Rise Again!” at Tokyo DisneySea, and explore delectable Halloween food and fabulous merch from Tokyo Disney Resort.